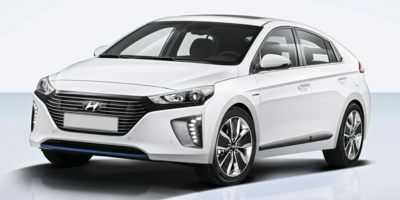 The 2019 Hyundai Ioniq Hybrid is a 5 passenger Automatic transmission, 4-door Large Passenger Car. It is available in 3 trim packages, the Blue, Limited, and SEL. The new Hyundai Ioniq Hybrid invoice price ranges from $21,694 to $27,251, while MSRP ranges from $22,400 to $28,550. The 2019 Hyundai Ioniq Hybrid is available in 6 exterior colors, Black Noir Pearl, Ceramic White, Intense Blue Metallic, Scarlet Red Pearl, Summit Gray Pearl, and Symphony Air Silver Metallic, and 2 interior colors, Beige, and Charcoal Black.